Corpach sawmill worker Jamie Alexander MacEachen was in court this week facing a charge involving speeding at 98mph. 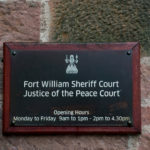 MacEachen, 20, of Fassifern Cottages, Kinlocheil, near Fort William, appeared at Fort William Sheriff Court on Tuesday and pleaded guilty to the amended charge of careless driving. Procurator Fiscal Depute Fiona Murray told the court the offence had taken place on July 19 this year on stretch of the A830 road at Kinlocheil and elsewhere. ‘Two police constables were carrying out a speed check in an unmarked police vehicle when they saw the accused driving apparently in excess of the speed limit which at this locus is 60mph,’ said Ms Murray. She went on to say that on checking MacEachen’s speed, the sawmill employee was clocked at 98mph. ‘The officers activated blue lights and sirens and made towards the vehicle. The followed it and saw it pull off the road onto a forestry trail and stop. The driver was shown the recorded speed of 98mph by the officers and stated that he understood,’ said Ms Murray. Defence agent Stephen Kennedy told Sheriff Eilidh MacDonald that his client, who had only been driving for a little over two years, was a single man who lived with his parents and worked in Corpach. Mr Kennedy said at the time of the offence, driving conditions were good, it was on a long stretch of straight road and there were no other vehicles nearby, or any pavements or pedestrians. ‘Mr MacEachen has worked at the local sawmill in Corpach for the last four years and if he is disqualified from driving for only a short period, his parents might be willing to provide transport, although that would be very inconvenient for them, but might be possible to let him keep his job.